This Cara Cara Orange and Citrus Drink is refreshing on a hot day. A splash of neutral tasting alcohol turns into a delicious cocktail drink. A few months ago I posted a recipe for Sweet Potato, Parmesan and Rosemary Biscuits. In that post, I talk about my daughter’s interest in helping me with the food styling and photography for my blog and her desire to help me style a post for lemonade. 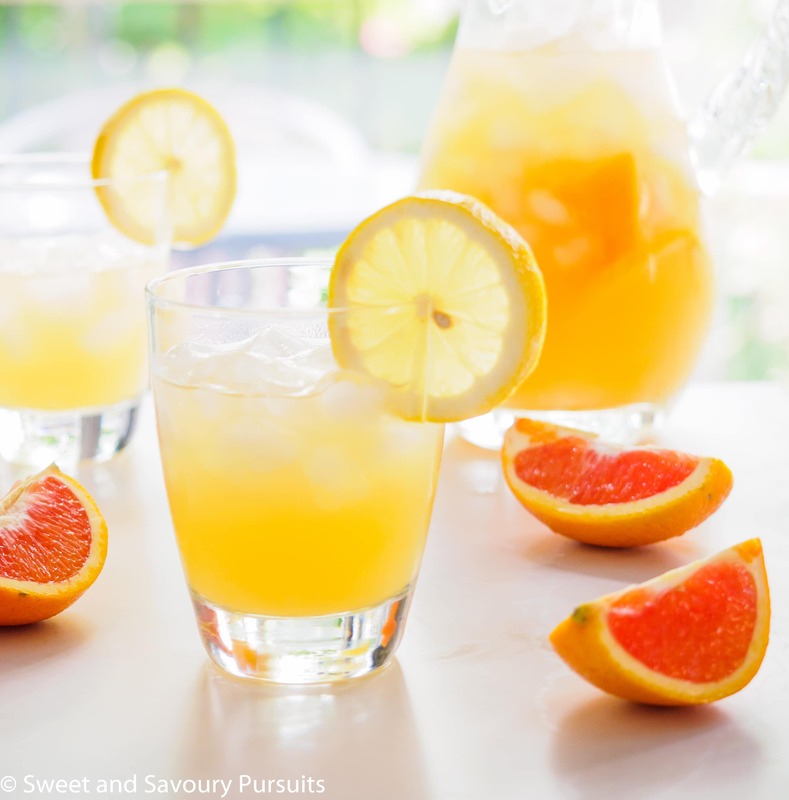 We never did get around to making a blog post for lemonade, but we did make this Cara Cara Orange and Citrus Drink and my daughter had a great time styling the pictures here. There is nothing like the freshness of citrus fruit on hot summer days. For this drink, I decided to use some Cara Cara Oranges, they are juicy, sweet and have such a gorgeous colour. I added the juice of one lime and a lemon for a bit more zing. Sweetened with a bit of honey (though you can use the sweetener of your choice), this is a great drink to share with kids on a beautiful summer day. Though the recipe for this drink is without alcohol, you can easily add a splash of a neutral tasting alcohol to turn this into a delicious cocktail for the adults. Enjoy! Juice the Cara Cara oranges, lime and lemon and combine in a pitcher. This should yield approximately 2 cups of citrus juice. Add 2 cups of water (or same amount as the citrus juice). Add honey (or other sweetener) and stir to dissolve. Taste and add more honey if you would like it sweeter. I used honey to sweeten this drink but you can use the sweetener of your choice. It is very refreshing! Thanks for stopping by. Gorgeous photos. This drink looks so lovely & refreshing. Thanks so much Alex, have a great long weekend! This sounds like a wonderful, refreshing drink–I love the blend of citrus flavors in this! Looks so refreshing! Can’t wait to try it. Thank you so much Myrna, I’m sure you’ll enjoy it! Hi Fida, your drink sounds delicious and refreshing, I like how it is not too sweet – delicious! Thank you Lily! I didn’t want a drink filled with sugar, so I kept it to a minimum. What a wonderful activity for you and your daughter to do together. This drink looks so crisp and refreshing – love it! I’ve never had a cara cara orange; is it a bit like a blood orange? Hi! Cara Cara oranges are not the same as Blood Oranges. Cara Cara oranges are actually a type of navel oranges that are lower in acid and usually sweeter. Their color is similar to that of pink grapefruit and not as deep red as Blood oranges. What a refreshing looking drink, sweet that your daughter is taking an interest in food photography. Fida, another beautiful photograph, this time with help from your daughter! I love the way the light plays on the orange colours, it looks so refreshing. Thanks so much Louise! Hope you have a great week!